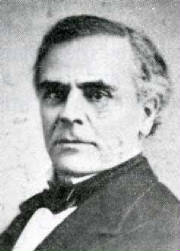 Richard Parker (December 22, 1810 – November 10, 1893) was a nineteenth century politician, lawyer and judge from Virginia. Born in Richmond, Virginia, Parker completed preparatory studies, studied law and was admitted to the bar, commencing practice in Berryville, Virginia. He held several local offices before being elected a Democrat to the United States House of Representatives in 1848, serving from 1849 to 1851. He was elected judge of the thirteenth judicial circuit of Virginia on January 15, 1851, serving until 1869. During his capacity of this seat, Parker pronounced the death sentence for abolitionist John Brown who was captured at Harpers Ferry, Virginia (now West Virginia) after his unsuccessful attempt to raise an insurrection in 1859. After retiring from the court, Parker resumed practicing law in Winchester, Virginia until his death there on November 10, 1893. He was interred in Mount Hebron Cemetery in Winchester. "The Trial of John Brown, at Charlestown, Virginia, for Treason and Murder." "The Trial of John Brown for Treason and Murder"
Sketched by Porte Crayon (David Strother). 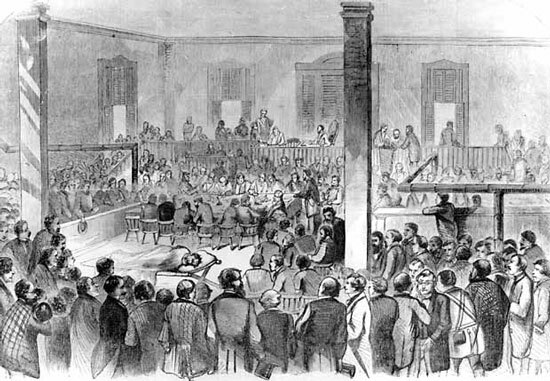 A stricken John Brown is depicted in the center of the courtroom. 1859. Historic Photo Collection, Harpers Ferry National Historic Park. "Gentlemen of the jury, what say you, is the prisoner at the bar, John Brown, guilty or not Guilty? Clerk--Guilty of treason and conspiring and advising with slaves to rebel and murder in the first degree? Notorious John Brown, sentenced by Judge Richard Parker, was hanged on December 2, 1859. Brian McGinty provides the first comprehensive account of the trial, which raised important questions about jurisdiction, judicial fairness, and the nature of treason under the American constitutional system. After the jury returned its guilty verdict, an appeal was quickly disposed of, and the governor of Virginia refused to grant clemency. Brown met his death not as an enemy of the American people but as an enemy of Southern slaveholders. Historians have long credited the Harpers Ferry raid with rousing the country to a fever pitch of sectionalism and accelerating the onset of the Civil War. McGinty sees Brown’s trial, rather than his raid, as the real turning point in the struggle between North and South. If Brown had been killed in Harpers Ferry (as he nearly was), or condemned to death in a summary court-martial, his raid would have had little effect. Because he survived to stand trial before a Virginia judge and jury, and argue the case against slavery with an eloquence that reverberated around the world, he became a symbol of the struggle to abolish slavery and a martyr to the cause of freedom. Vividly re-creating the world in which Brown and his compatriots lived with a combination of scrupulous original research, new perspectives, and a sensitive historical imagination, Patriotic Treason narrates the dramatic life of the first U.S. citizen committed to absolute racial equality. Here are his friendships (Brown lived, worked, ate, and fought alongside African Americans, in defiance of the culture around him), his family (he turned his twenty children by two wives into a dedicated militia), and his ideals (inspired by the Declaration of Independence and the Golden Rule, he collaborated with black leaders such as Frederick Douglass, Martin Delany, and Harriet Tubman to overthrow slavery). Evan Carton captures the complex, tragic, and provocative story of Brown the committed abolitionist, Brown the tender yet demanding and often absent father and husband, and Brown the radical American patriot who attacked the American state in the name of American principles. Through new research into archives, attention to overlooked family letters, and reinterpretation of documents and events, Carton essentially reveals a missing link in American history. A wrenching family saga, Patriotic Treason positions John Brown at the heart of our most profound and enduring national debates. As definitions of patriotism and treason are fiercely contested, as some criticize religious extremism while others mourn religion's decline, and as race relations in America remain unresolved, John Brown's story speaks to us as never before, reminding us that one courageous individual can change the course of history. Complicity reveals the cruel truth about the Triangle Trade of molasses, rum, and slaves that lucratively linked the North to the West Indies and Africa; discloses the reality of Northern empires built on profits from rum, cotton, and ivory–and run, in some cases, by abolitionists; and exposes the thousand-acre plantations that existed in towns such as Salem, Connecticut. Here, too, are eye-opening accounts of the individuals who profited directly from slavery far from the Mason-Dixon line–including Nathaniel Gordon of Maine, the only slave trader sentenced to die in the United States, who even as an inmate of New York’s infamous Tombs prison was supported by a shockingly large percentage of the city; Patty Cannon, whose brutal gang kidnapped free blacks from Northern states and sold them into slavery; and the Philadelphia doctor Samuel Morton, eminent in the nineteenth-century field of “race science,” which purported to prove the inferiority of African-born black people. Culled from long-ignored documents and reports–and bolstered by rarely seen photos, publications, maps, and period drawings–Complicity is a fascinating and sobering work that actually does what so many books pretend to do: shed light on America’s past. Expanded from the celebrated Hartford Courant special report that the Connecticut Department of Education sent to every middle school and high school in the state (the original work is required readings in many college classrooms,) this new book is sure to become a must-read reference everywhere. He was not alone, DeCaro shows, in understanding abolitionism through a religious lens. American Protestant thought pushed many Christians to activism. The post-millennial theology of the day insisted that Jesus would return to Earth only after a 1,000-year reign of peace; this theology of optimism encouraged many Christians to get involved in reform campaigns like abolitionism, as they tried to help make the world a better place and hasten Jesus' return. In this context, DeCaro suggests, the raid at Harper's Ferry looks less like extremist violence and more like heroic self-sacrifice; Brown's death looks less like a madman's suicide and more like a martyrdom. DeCaro's portrayal of John Brown is hardly path-breaking. Scholars have long understood the connections between post-millennialism and abolitionism, and many writers, from W.E.B. Du Bois to Russell Banks, have previously suggested that Brown's politics were bound up with his faith. Nonetheless, this useful book-length study is a welcome addition to the literature on John Brown. 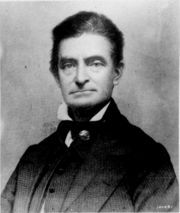 Copyright 2002 Reed Business Information, Inc. From Library Journal: When abolitionist martyr John Brown led an armed raid on Harper's Ferry, VA, in October 1859, he helped set the stage for the American Civil War. Yet as pastor and educator DeCaro points out, Brown himself felt that all life was precious, claiming that he would fight no war "unless it was a war of liberty." DeCaro (Malcolm and the Cross) sets out to establish Brown's legacy as one grounded in an alternative evangelical tradition that decried pacifism, developed a doctrine of holy war, and called any church that did not actively work for abolition anti-Christian. He places Brown in his religious milieu, reforming the legacy of this religious extremist into "a [Protestant] saint in his own way a sincere believer, however imperfect, also believing himself carried along by God's grace and mercy." Combining a moral and ethical abhorrence of slavery with a genuine religious fervor, he is the modern embodiment of that most reviled social pariah, the uncompromising fanatic. More ambitious than a popular history but not quite a scholarly treatise, DeCaro's plainly written book may find an audience among readers with a deep interest in history and religion. Recommended for larger public and academic libraries. Sandra Collins, Duquesne University Library, Pittsburgh. Copyright 2002 Reed Business Information, Inc.